I have a collection of antique matchbooks that have resided in storage, waiting for a new purpose. At my mom’s suggestion to turn them into mini books, I pulled them out and began the transformation (thanks Mom!). What a great way to lose the flammability and keep the nostalgia! If you’d like to try this yourself, here’s a quick how-to. 1. Choose a paper or papers to use as pages. 2. Using an awl or similar tool, gently pry open the back prongs of the staple holding the matchbook together. 3. Remove the matches, leaving the staple in the front portion of the matchbook (be careful not to tear through the cover with the staple). 4. Cut your paper to the size of the matches and make a stack of pages about the same thickness as the chipboard portion of the matches. 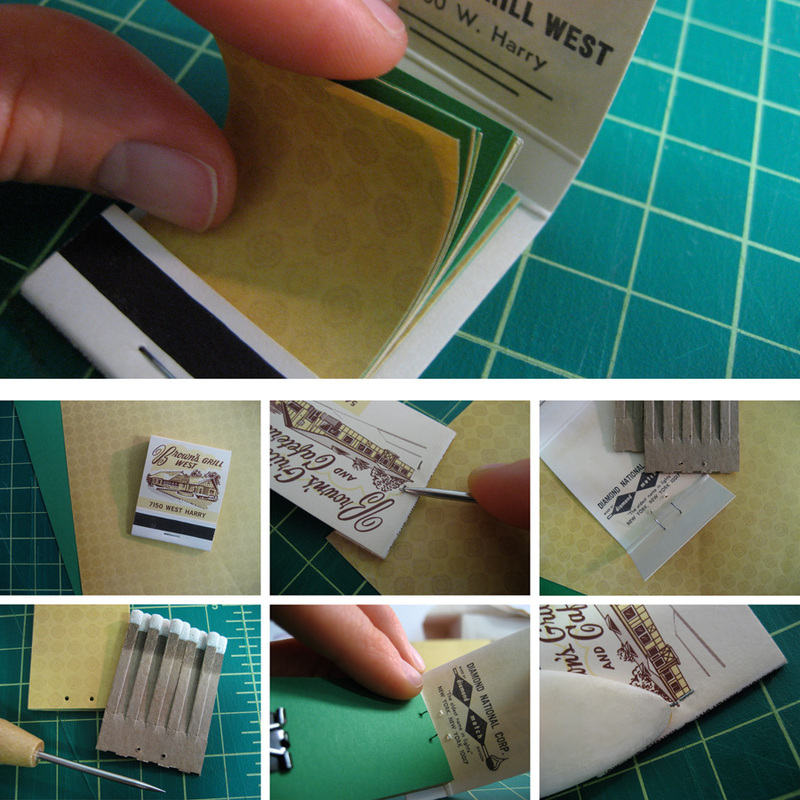 Using the matches as a guide, punch two holes in the base of your stack of pages. 5. Place the stack of pages within the cover by guiding the staple through the holes at the base of the pages. 6. Thread the staple back through the back cover of the matchbook and use a bone folder or similar tool to press the prongs back into place. Voilá! You now have a new little book to write secret notes in or other things of similar importance. You are currently browsing the Erinzam News weblog archives for June, 2007.